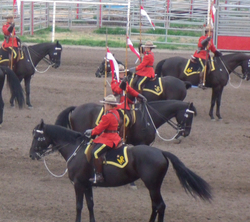 The Royal Canadian Mounted Police (RCMP) will bring the Musical Ride to Amberlea Meadows on July 25th and 26th for Leduc and area residents. This will be the Ride’s second visit to Amberlea Meadows, as they demonstrated their skills in 2010. As in 2010, all net proceeds from the Musical Ride are in aid of the Kids with Cancer Society. The RCMP began demonstrating their riding skills almost immediately after the force’s creation in 1873. Originally, the force was to be 150 strong, but within a year that number was doubled. George Arthur French was appointed the first permanent Commissioner of the NWMP. French was persistent in his efforts to recruit the best candidates, provide the best training, and establish high standards of discipline and morale. A key component of the force was to be the horses the force would need to use. The Force’s horses came from all over Eastern Canada. The horse was a key component of early Canadian life. The early Force sought horses which were four to seven years old, at least fourteen hands high, and, would pay as much as $125 per horse. The RCMP used the British Cavalry model and split the force into six troops of 50 men each. To distinguish each troop, horses of a particular color were assigned to the various troops. A Troop rode dark bay horses; B Troop rode dark brown horses; C Troop rode chestnut coloured horses; D Troop rode gray horses; E Troop rode black horses; and F Troop rode light bay horses. Just prior to their March West, in 1874, the entire force went on Parade. It would be the first and only time that the entire force would take part in a demonstration of their horsemanship. It would not be until 1887 before a second demonstration was performed. This time it was held in Regina and consisted of 32 riders. This would become the standard for future rides, which became known as the Musical Ride. Early in the force’s history, several of the Troops carried the British lance, and it was adopted as part of the Musical Ride’s equipment. Today the lance is an exclusive part of the Ride. It would not be until 1901 when the general public was able to observe the RCMP Musical Ride. During World War I the force was again expanded, and in 1915, the Musical Ride used 60 members. It would be the largest demonstration performed by the force in public. After the war, the Ride was on the move and made its first performance overseas in, of all places, Vladivostok, Russia, before an audience of 10,000. The Ride moved to Ottawa in 1921 but from 1921 to 1939 various Divisions would also perform Musical Rides within their assigned territories. It would not be until 1961 that a permanent home for the Ride was based in Rockcliffe in Ottawa. Since then, the Musical Ride has become known worldwide and is a major symbol of Canada. The Ride itself has matured from a unit of recruits in the final phase of their training, to a unit of volunteers from within the ranks of the Force, including women. The Musical Ride has performed all over the world and the Leduc area is very fortunate to have this opportunity to enjoy the Ride in their backyard! The two performances will take place on July 25th, Friday evening, at 7:00 P.M and on Saturday, July 26th at 1:00 P.M. Tickets are $15.00 each or $60.00 for a family. Family includes up to five immediate family members. Under five-year old children are free. Remember, the net proceeds will go to the aid of the Kids with Cancer Society.